Francisco Cuenca has said that this renovation not only offers a better service to passegers, but improves the image of this infrastructure and the image of the city. 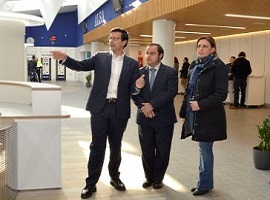 The Major of Granada, Francisco Cuenca, has visited on the morning of the 4th of February 2019 the recently renewed bus station where, have been invested 230.000 euros, have been totally reshaped customer service area and the toilets, and created a new VIP area. 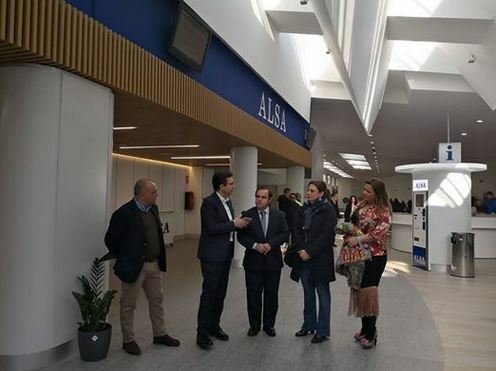 The first council, joined by the director of ALSA Andalucía, Valeriano Díaz, has assured that this actuation not only offers a better service to customers, but improves the image of this infrastructure and consequently the image of the city. So, ticketing area located on the first floor has been reshaped totally, creating a new concept that allows a closer and personalised attencion to passenger, on an open concept integrated on current hall, where remains the informative point and the automatic ticket vending machine. Also has been renewed two toilet areas of the station, both located on the ground floor and in the cafeteria, improving their accessibility conditions for disabled people in respond of a requirement of the City Council to the concessionary company. Finally, there has been installed on the ground floor a new VIP area, exclusive for Premium passengers of ALSA company from Granada. Therein passengers can leave their luggage, read the newspapers, TV and Wi-Fi, or have a coffee. For the Major, who has explained that the renewal has been made in an area of 600 square meters, pretend to give a better service, both for passengers of Alsa both to the rest of companies operating in this station, in the conviction that bus stations are key infrastructures for the companies to raise quality level of service to passengers. He also remembered that the renewal of the Bus Station is added to improvements on the roofs, painting, inner signaling and conditioning, among others, made since its inauguration in 1996, Cuenca, that has been joined too by Mobility Council, Raquel Ruz, has ended that for grenadian and usual users of the station, this new actuation benefits thousand of tourists that arrive to our city using one of the best and modern stations existing in Spain.